I haven't blogged in a long time. I feel like maybe it's time to start again. I feel like God has given me a job to do, to advocate for the children in my community with rare cancers. I feel that God has opened doors for me, like on Monday when I was able to join other SSFL advocates to talk to Assemblymember Matt Dababneh's staff. And on Tuesday when I was able to speak at the Los Angeles Supervisors' Board meeting. These are amazing opportunities that I never wanted. They deplete me emotionally, because when I go, I am admitting how deeply cancer hurt Grace. I have to try to convince people more powerful than myself to protect us. I have to look the problem in the eye and pretend to not be scared. 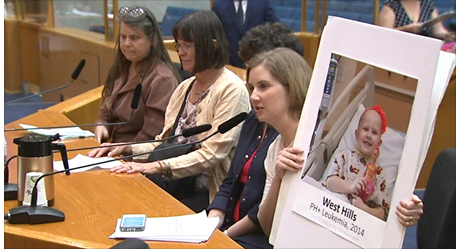 I first heard of the Santa Susana Field Lab when Grace was diagnosed in early 2014. A family member sent me paperwork on it. I didn't read past the headline before throwing the article in the trash. We live less than 5 miles from the site. To think I somehow contributed to Grace getting cancer by living near a toxic site was too painful, so painful that I was not able to deal with it at the time. 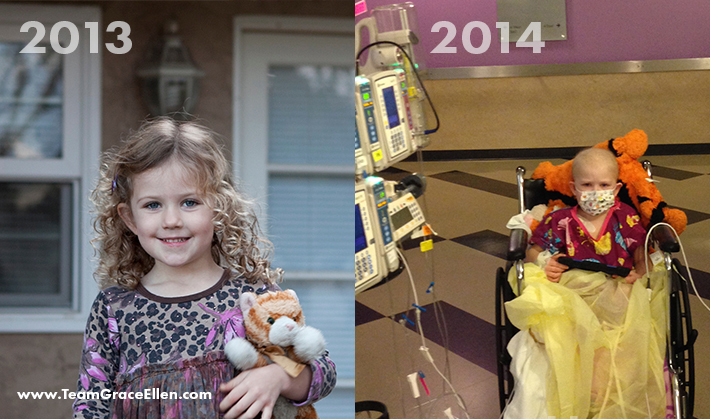 Six months after Grace was diagnosed, she and I were walking the halls at Children's Hospital during an inpatient stay. A mom opened her door and stuck her head out. "I know you two," she said. 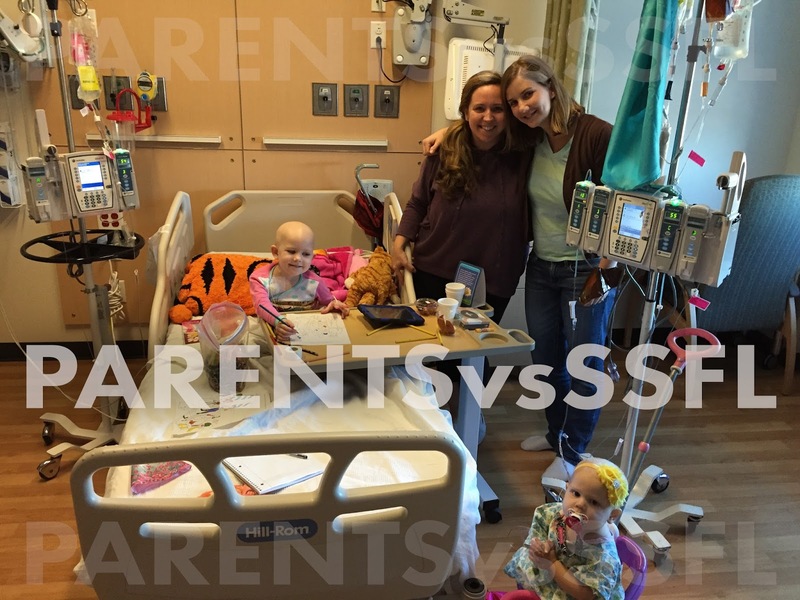 "You and your kids were at the park before my daughter was diagnosed. I recognize your daughter because she was bald that day and I remember her face. My daughter has neuroblastoma cancer now." Later I went home and looked up pictures I had taken on that day at the park. Julia and her daughter Bailey were in the background of all of them. I figured it was unlikely, but possible, that they could live that close- after all, we're in a populated area. Julia and Bailey became very close friends of ours. Though two years apart in age, Grace and Bailey were kindred spirits- sassy, glam queens who both loved Elsa. Ten months later I attended Bailey's funeral. 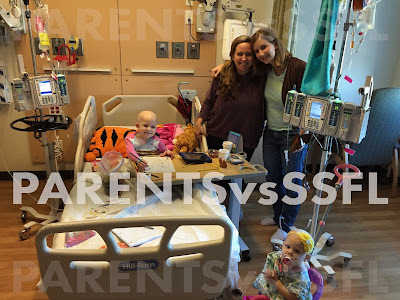 I met a different mom in the CHLA oncology clinic where both our girls were getting chemo that day. During our conversation I realized she lived over the hill in Simi Valley. "We're probably a few miles away, as the bird flies," she said. I didn't like the sound of that, but I accepted it as chance. "Yes, my son has an eye-brain cancer, we used to live right near you when he was diagnosed," another mom said when she was commenting on my "Childhood Cancer Awareness" decorations on our car. "Our neighbor's daughter was nineteen, she had the same cancer my son did, the same year too. She died from it." I asked where they had lived. They lived on my street. That same month, September 2015, I heard that the Santa Susana Field Lab was hosting a community forum where they would tell us if the site was toxic. (Copy of the 2015 SSFL slide presentation can be viewed here). I attended along with five or six other cancer moms. They told us that there was no elevated cancer risk to the community. They showed us charts and graphs of how much toxins were on site and the risks to our families. At the very end of the presentation they informed us that most of the charts shown had been hypothetical. 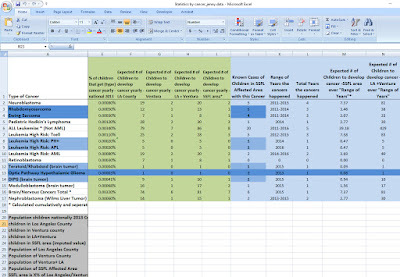 If my memory is right, when I asked to see the real numbers (I wanted to see toxicity levels, and exposure risks, etc.) I was told they were very scientific and difficult for people like me to understand- even though it was meant to be a meeting for the community- for people like me. After that I climbed back into denial. I stopped looking for kids to add to our map. I stopped thinking about the SSFL, except that I didn't let the kids eat oranges from our tree anymore. I focused on my family and getting Grace healthy again. I couldn't deal with the concept that danger was in our backyard. It was full denial. Every time I panicked it was because I was still afraid of the SSFL. I was afraid that another child had been diagnosed with cancer because I was too afraid to tell our community of the dangers. And I was too afraid because I wasn't even sure what those dangers were. I didn't want to cause a panic if the site was safe like the SSFL scientists claimed. And it hurt, it hurt me to the core of my mommy identity, every time I worried that I was keeping my children exposed. I felt so completely powerless. It was easier to stay in denial. So I stayed in denial. Four weeks ago, 2017, I was informed by a trusted SSFL advocate that the Department of Energy was trying to get out of their 2010 promise to clean the site and that we had only weeks to let the community know about the situation if there was any hope of a cleanup. Otherwise the toxic and nuclear contaminants would be left there permanently. I decided denial was as painful as it would be to do something. And even though it continues to be deeply painful to me as I advocate for the cleanup, at least it's pain that's going to bring healing to our environment and will protect other children. I started reaching out to other cancer parents I knew. 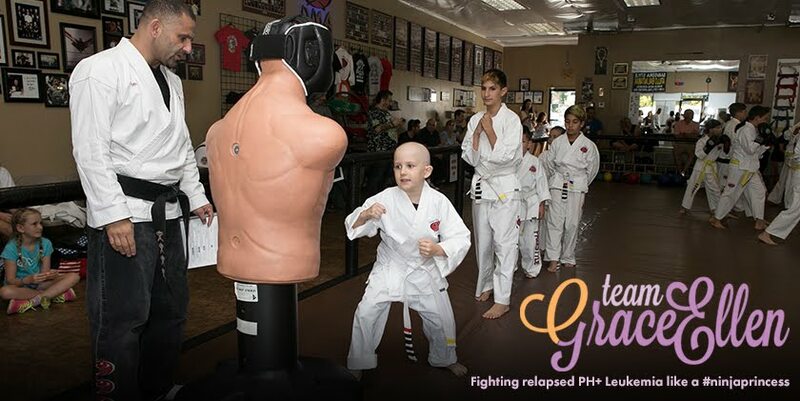 They helped me find more kids in our community with cancer. Every time I add a child to the cancer map, I have to take time out after to grieve. Every time. It's like Grace being diagnosed all over again. The emotional pain has not lessened, and I don't think it ever will. Still, I will continue to seek out the truth. 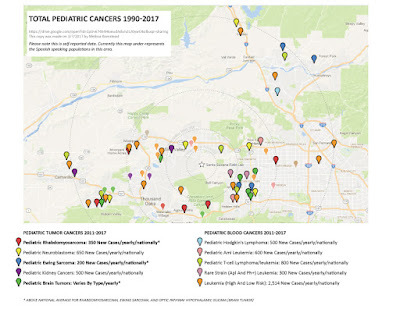 I found children with absurdly rare cancers, all within 20 miles of the SSFL, and I mean absurdly rare even in the rare world of childhood cancer. Ewings Sarcoma has about 200 cases a year. 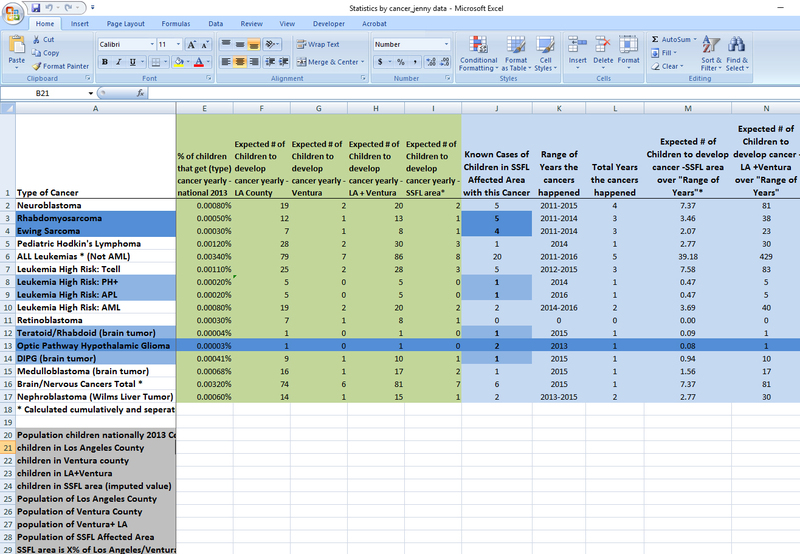 200 out of 73,941,848 children in America. We had two teens, from the same high school, the same year diagnosed with that disease last year. 2 out of 200. That's 1% of America's population at the same high school in West Hills. To be clear, the West Hills is not 1% of America's population. It's 0.01%. Rhabdomyoscaroma has 370 new cases each year. We had 5 children over a three year period- an absurdly high number for such a rare cancer. The Optic Pathway Hypothalamic Glioma (eye-brain) cancer has 25 cases in America. That's 25 out of 74 million kids. And we had 2 of them on the same street, the same year. 10% of America's children with this rare eye-brain cancer were living on my street. These are facts that I can now state with a controlled voice because they're numbers that I've been reciting a lot these last few weeks. But when I hold up the photos of these kids who belong to these number, I break. I know, or know the parents of, almost every single child on our map. 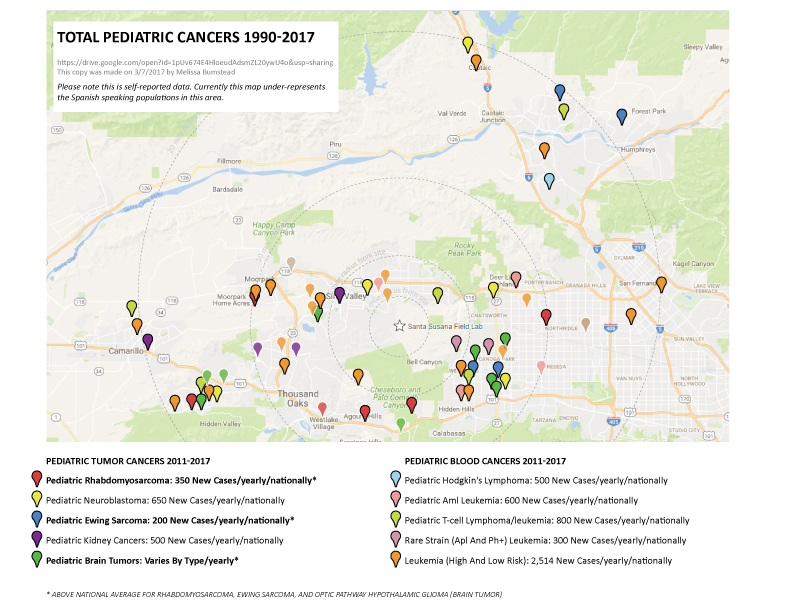 I continue to find more cancer kids in our area daily, and it continues to break me. I have also attended more meetings about the SSFL, hoping to educate myself, because there are days when denial is so tempting, I some days convince myself that the threat isn't real. When I learned plutonium is on site, that is one hard fact that brings me back to the reality that this isn't something I'm making up. This isn't scare tactics. They SSFL scientists use lots of words that often confuse me, but I'm not so naive to think that plutonium is safe no matter what they say. And that is only one of the many dangerous contaminants I've been learning about that will stay permanently in our hills unless we demand the full clean up. I've also learned that there has been a lot of deception to the community. And I say this as a person who doesn't like drama and hates confrontation. The Department of Energy, NASA and Boeing (who co-own the site) continue to claim that nothing has migrated offsite and that the site is safe. This to me, this only proves more that the site really is toxic, that the companies responsible have been negligent, and that the dangers to our community are being downplayed. Then I think of my daughter Grace, that she was addicted to morphine at four years old to manage the pain from her chemo...and I can't. I can't be in denial anymore. 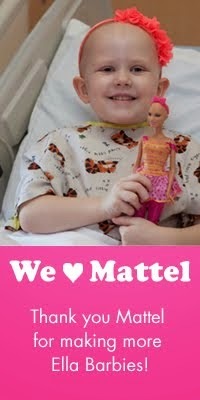 No child should suffer cancer, and no parents should suffer the death of their child. Not when we can stop it-and we can by demanding a full clean up. If you haven't already please send a comment to the Department of Energy to ask for the full cleanup, and please sign our national petition. Please share this post and help us inform the public that we need to stand up and demand a 100% clean up. We need fearless moms (and dads) who are willing to make their voices heard for the sake of the kids who can't speak for themselves. Melissa: You are doing the work that God intends you to be doing. Your efforts will benefit many. You are creating a meaningful self-legacy. Years from now, your children will look at you and your work with pride. You have my respect.